I didn’t want to miss a chance to run in Ottawa, so I got up at 06:10 and went for a run in the nearby area. In doing so I came across the Byward Market area and thought it might be a good spot for dinner in the evening. I got back at 06:45, got ready, and went for breakfast as quickly as I could manage. Breakfast was an American style one for CAD$10, and a good portion of that was a tip meaning it was a very cheap breakfast. We’d wanted breakfast quickly so we could be at Parliament Hill as early as possible for tickets. The reasoning behind this is that there are a limited number each day, and as they’re free they run out quickly. The ones for the 09:20 tour disappeared quickly, as even queuing thirty minutes before the opening time was not early enough. We got the 09:50 tour, checked our bags, and headed over to the base of the Peace Tower ready for the tour to start - since we needed to be there twenty minutes before. When our time came we were led inside, and passed through the security that is now common for important tourist attractions. On the other side we had a bit of a wait until the start of our tour. The guide, Paige, explained where we could and couldn’t photograph and then led us upstairs to a hallway that is often used when the media interviews politicians. 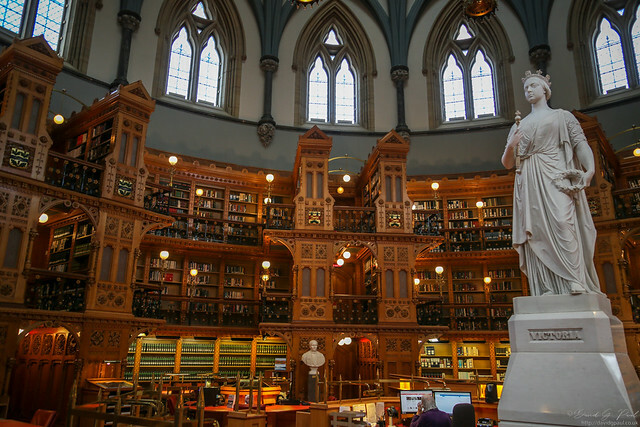 A lot of the design of this room, and in fact a lot of the building, is centered around the history of the land that became Canada. 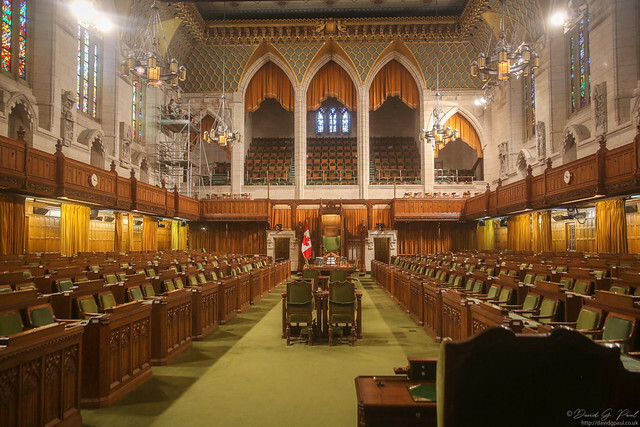 Our next stop was the House of Commons, which is styled to try and resemble Westminster, and to try and make it look a little more like this they went for a green colour scheme. I think there’s a few features it misses though. Next we saw the library, and was told about it before entering so that we could be silent once inside. It’s the oldest part of the building due to a fire in which only the library and the books were saved due to quick thinking librarians. I guess they’re surrounded by knowledge, they’re bound to be intelligent. Our final part of the guided tour was the Senate. This room is a little more ornate and has thrones to be used by the Prime Minister, and the head of state. In the case of Canada the real head of state is Queen Elizabeth II of the United Kingdom; but for most of the time it is the Governor General who rules in her stead. This brought the guided tour to a conclusion, but we could continue on by ourselves up the peace tower, and to the memorial room. The queue for the peace tower was a little disorganised, and with queue jumpers it resulted in this taking around an hour. From the top there are however some good views of Ottawa, and Gatineau on the other side of the river. It was now midday, so we made our way slowly to Rideau Hall, and found a place to sit down and have the lunch we’d prepared earlier. The day was getting warmer so it was nice to be out of the sun for a while. This was not what I'd expected of Canada. This tour was for about a dozen people, and was completely free. 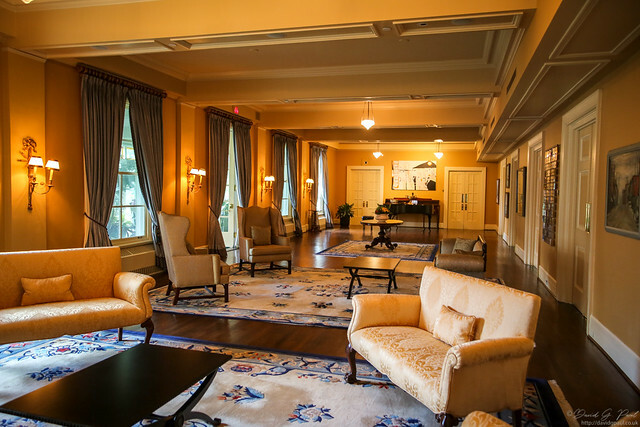 We were led around the side of the hall and through security at what is called the Princess Anne entrance which is an accessible one which most employees of the residence use. 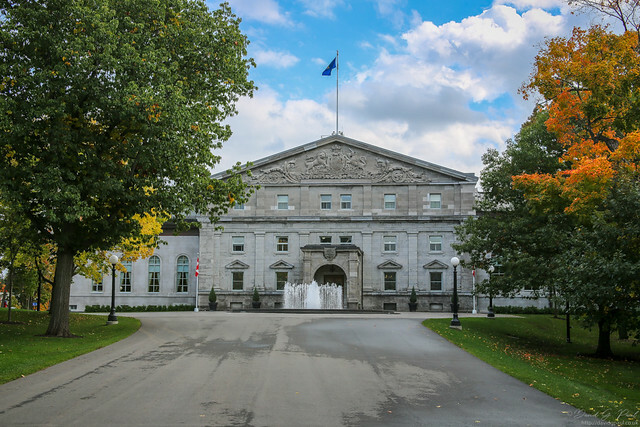 The current sitting Governor General, Julie Payette - a former astronaut, was in residence but we never saw her whilst there. We started by going through the room with the portraits of spouses, and up the stairs into the main hall with the Queen’s entrance. This room is filled with portraits of previous Governor Generals, and to the right we entered the Tent Room. Strangely the room is sort of what it’s named after. The walls are made of pink and white fabric that continue up to and drape across the ceiling. The reason this room looks like an indoor tent is apparently due to the Earl of Dufferin who had used this to decorate the room which was also doubling as an indoor tennis court. Adjacent to that room is the long hall which can be opened up to expand the seating area of the tent room. Whilst we were there it was furnished as a sitting room, and is a place the current Governor General can often be found. I guess just not during tourism hours. We saw a few more rooms and then exited through the Queen’s entrance. 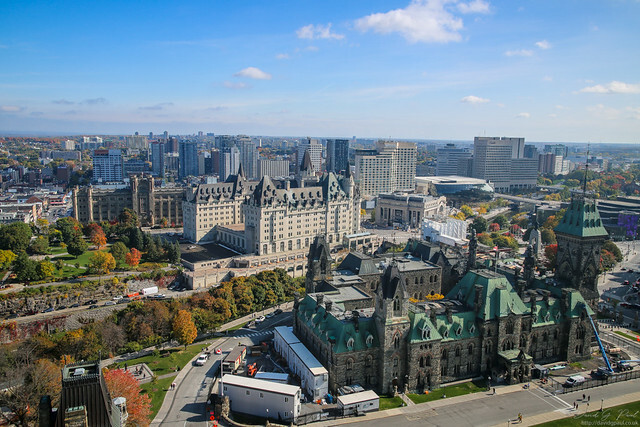 As we wanted to see the Canadian Museum of History next we decided to book an Uber - it would have been about an hour to walk across the Alexander bridge into Gatineau from where we were. So this unexpectedly became my first time in the province of Québec. The museum was going to be closing in around two hours, and they recommend seven hours to see everything. They warned us against it, but we paid for the tickets and saw it as a challenge to see it all. One thing of note here is that the ticket prices do not include tax, and the tax is higher due to being in Québec and not Ontario. We started downstairs on the first level where they have exhibits on the history of the first peoples of the region that became Canada. There are massive totem poles that stand higher than even a couple of people standing on shoulders would be. These were in front of fake wooden buildings which housed many other artefacts. 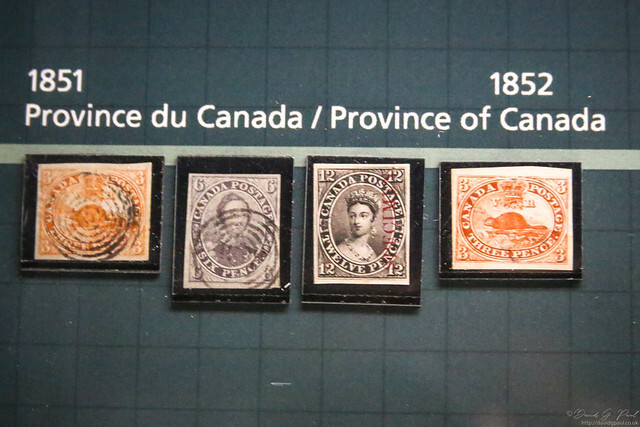 It’s not often that you see something you’ve got on display in a museum; but here they had a room filled with every postage stamp produced in Canada. There were many that I’d got, but they had many others such as the very first ones. On the next floor they had a special exhibition on medieval Europe - a subject I’ve seen covered many times before. Between reading, documentaries, and things I’d seen in museums I’ve visited around Europe there were certainly quite a few things I already knew about; but it was interesting regardless. The final floor was split into three galleries based on different time periods. Each of these had a number of artefacts that explained the changes in Canada over time. One of the strangest parts of this was where they’d rebuilt a church inside the museum. We finished just five minutes before the museum closed - so much for needing a full day there. Although we’d been driven to the museum, we decided we could walk back and look for somewhere to eat along the way. As we crossed the bridge we paused to photograph the Parliament Hill, and continued on to the Byward Market. We looked at a few different places, and eventually decided on the first one we’d looked at. It took fifteen minutes for us to be served in the almost empty restaurant, and then it a further thirty-five minutes to get the food. It seems typical that the slowest service would be on a day when we wanted to be eating earlier. On our way back to the hotel we stopped by Tim Hortons, a Canadian favourite, to pick up some more doughnuts and ‘Timbits’. It’s a shame they were stale this time.